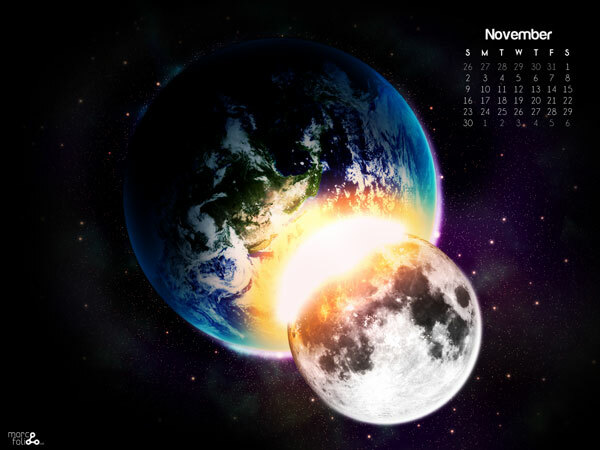 Planet Collision: Free November 2009 Calendar Wallpaper was originally my entry for the Desktop Wallpaper collection on SmashingMagazine. Sadly, my wallpapers weren't selected to be included in the list, but I still wanted to share them with the rest of the world. I hope you enjoy them and use them as your wallpaper. These wallpapers are totally free for all kinds of use. Next to the versions that has a calender on them, the non-calender version has been included (in case you want to use it in other months too). These wallpapers come in a 4:3 (normal) and 16:9 (widescreen) aspect ratio. 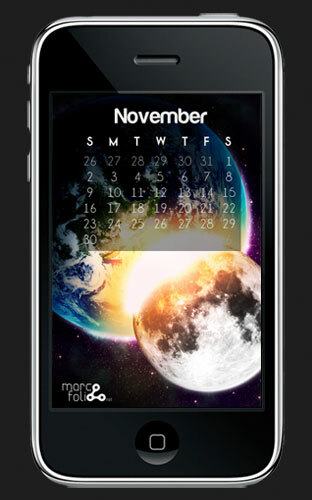 Also, an iPhone version has been included. The wallpaper was my outcome after following the great space explosion tutorial. Download this wallpaper pack from the Download section. I hope you like this wallpaper pack. Enjoy!